March 2011: At the moment there is a lot of conflict in North Africa and Yemen. It will possibly spread to the other parts of Asia and the Middle East. This is a good thing in the long run as in every case it is caused by a desire for democracy, the only form of government that satisfies the human spirit despite all its flaws. We are concerned for the brave people who are protesting and sometimes sacrificing their lives. It is a worrying time for all the world. Will it lead to a wider conflict. It might. I sense that it might. What will fill the vacuum left by the ousted governments? Will it be extremism and will that lead to conflict with the West? Will the conflict lead to a surge in oil prices? Look how dependent we are on oil and a lot of it comes out of the ground in countries that are dictatorships or semi-dictatorships. The oil companies have made us dependent on oil. It is a good business model. They could have researched good alternative energy sources by now but stifled it to suit their own ends. It is irresponsible behavior. Oil companies, like banks, have a wider responsibility than just serving their shareholders. What they do affects everyone. In these difficult times with people getting hurt I would like to think of the cats of North Africa too. This may seem almost frivolous and idiotic. 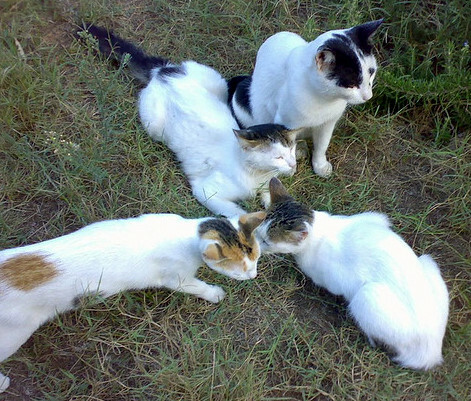 Some visitors will say it is idiotic to think of the cats of Libya at a time when people are being killed. I disagree. I guess I would. The cats many of which will be domestic cats will be suffering too. Some will be killed, some starved. On my assessment the domestic cats of North Africa live primarily outside in parallel with their human companions. They are often attached to a shop, perhaps a shop selling food. This is apparent when looking at the photographs of Valley Girl a colleague of mine. I posted an article on my blogger site about the cats of Morocco, discussing this. The cats heading this page are typical of the North African domestic and feral cat. They are slender with lots of white (white spotting gene causes this). Van markings are common. I mean that these cats have the same genes as the Turkish Van in respect of their coat pattern. All the cats in the picture above Van markings. All the shops in towns like Zawiyah are closed in this conflict. Zawiyah is 30 miles west of Tripoli so is on the front line but there will be similar scenarios throughout Libya I would have thought. People will have concerns that place the domestic cat down the list of priorities much like in the recession in the United States but even more so. There is no doubt that the domestic cat will at least on occasion suffer hardship and loss of life. For the feral cats of Libya, lurking down dark, dusty alleys life is infinitely harder. All animals suffer as much if not more than the people in war and violent conflict. I think they deserve a mention as they are truly an example of the suffering of the innocent. I agree with you Ruth. The sad thing is that although what is happening in war torn parts of the world is awful the people concerned understand all about what action they must take to preserve life and limb. Unfortunately animals can’t understand the changes around them; they don’t know what to do especially when they have been abandoned. So I agree I feel desparately sorry for people who find themselves in these circumstances but I also feel sorry for the animals. Michael being concerned for the cats isn’t almost frivolous and idiotic, it’s being caring and compassionate and I for one admire you very much for that. What a lot of people who don’t care about animals don’t understand is that because we do care it doesn’t mean we don’t care about people too. We can and do care about both. Innocent people and animals always get caught up in conflicts and it’s very sad and it makes me feel very helpless.